East Meadow, N.Y. — Dan Lasko, a broad-shouldered former Marine wearing green-trimmed blue swim goggles, emerged from the locker room at Nassau County Aquatic Center, ready to hit the pool with a brand new leg. It was the first time in years that he would be able to stride from the pool deck into the water without having to remove his reliable prosthesis, the one with an Asics sneaker attached, then hopping one-legged on the slippery deck to get in. And until now, as a longtime triathlete, he had mostly relied on his arms for the first part of his swim-bike-runs. He couldn’t wait to use a water-friendly prosthesis that would match the power of his intact right leg. The new leg Mr. Lasko would be testing had a jet-black foot with a nonslip tread on its sole, which he described as “awesome” even before entering the water. His excitement was palpable from the first whiff of chlorine. Todd Goldstein, the designer, with a freshly minted doctorate in molecular biology and tissue engineering, was enlisted for the project in part because of his experience with 3-D printing. 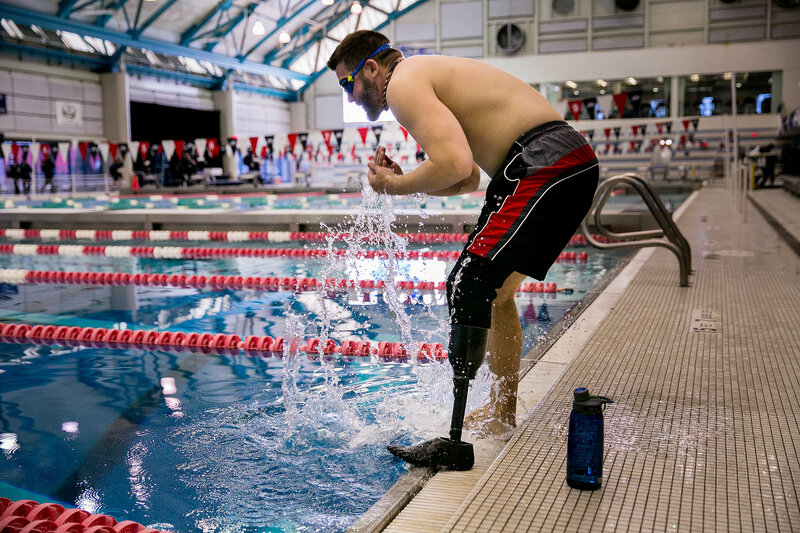 On a Friday night before the swim test, he programmed a 3-D printer to make a crucial part of the prosthesis: a downward-pointing triangle of nylon and plastic located at calf height that provides some propulsion but, with cone-shaped holes that lets some water through, is not overly forceful. Mr. Lasko, at first not comfortable enough with the new leg to dive in, stepped into the water and took off into a gliding freestyle. He had not swum like this, using both legs, since his injury at age 21. Dr. Goldstein turned some screws to secure it, but a few laps later, it fell off again and briefly went missing, until it was discovered snagged in the lane lines. Dr. Goldstein, by now a poolside MacGyver, found nylon cable ties to temporarily secure the triangle to the prosthesis. Final tweaks have been made, and now the triangle is firmly secured. He should have his swim leg soon, in plenty of time for him to horse around with his sons, Ben and Luke, at the pool this summer. For Mr. Lasko, getting a new prosthetic leg for swimming is comparable to getting new shoes or gear for specific sports. “You don’t wear CrossFit gym sneakers to run a marathon,” he said. He’s got one leg for walking, one for high-impact exercise, one for cycling, and even one for sprinting, all in a special closet. The new swim leg will be Mr. Lasko’s seventh. The device is expected to become commercially available in about six months, said Eric Feinstein, a manager at Northwell Ventures, the venture capital arm of Northwell Health, a network of hospitals and local facilities, which funded the project. Eschen’s high-end ready-made parts were used, and Composite Prototyping Center, also based on Long Island, provided equipment and machinery. 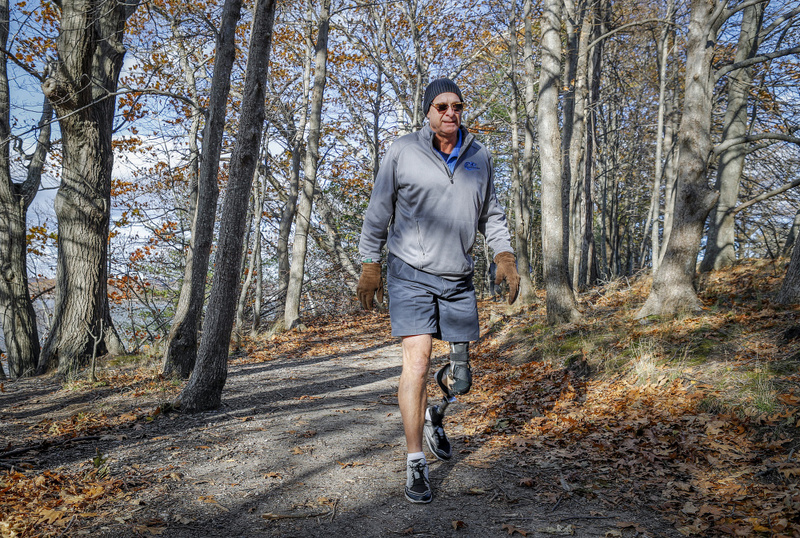 An estimated 1.9 million people have lost a limb nationwide, a number that is expected to double by 2050, mostly as a result of diabetes, according to the Amputee Coalition of America, a nonprofit organization devoted to advocacy and education. 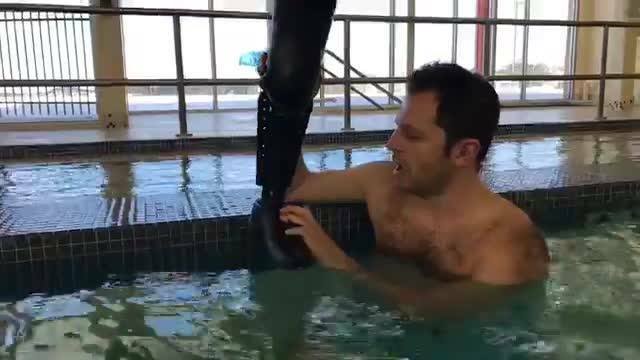 Even amputees who aren’t aiming to participate in triathlons may want the convenience and versatility of this kind of swim leg, which can also be used in saltwater. Swimming is particularly good exercise for amputees, Dr. Crandell added, because it “doesn’t put shear force on the residual limb. They are not running or jumping.” The end of that limb can develop blisters, or deeper tissue wounds, during high-impact sports like jogging, but doing laps is more “skin friendly,” he said. After swimming on and off for a couple hours, Mr. Lasko’s energy was flagging. But he couldn’t resist trying one of the diving boards at the expansive facility. By then, feeling sure of his footing, he was backing all the way up the board, taking a couple of stomps and diving off. He did this again and again. Then he did a flip. Then a flip and a half — ouch, awkward landing. “Not too bad,” he rated himself while easily climbing the pool’s ladder. He was beaming like a child who just got a new gadget.